This former hotel has been converted into a unique holiday home and is ideal for family holidays. 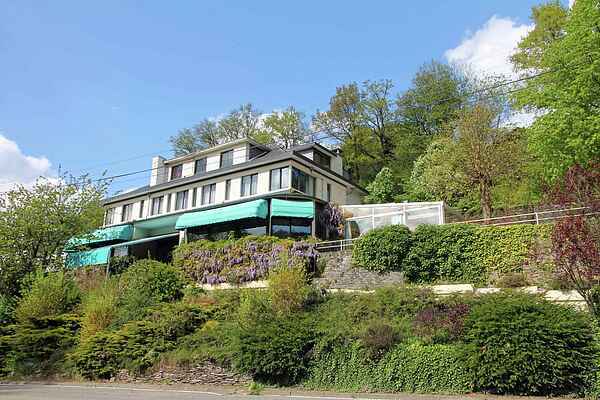 The holiday home is on the riverside of the river Ourthe, a stone's throw away from La Roche-en-Ardenne. From the living room and patio you'll have stunning views of the Ourthe Valley. Play a game of ping pong while the children amuse themselves in the play area. In the evenings gather around the open fire or enjoy a drink at the bar. This holiday home is aimed at families. The surrounding area lends itself for fun day trips. Visit for example the caves of Hotten, Domaine du Floréal, Deister, Nisramont and Rochers du Hérou. In La Roche-en-Ardenne you can go for walks, bike rides, and play tennis. And also the brewery of Achouffe and nature reserve Chlorophylle in Dochamps are definitely worth a visit. In the winter you'll find cross country skiing and skiing opportunities in Vecmont, Samrée, Nadrin, Odeigne and Baraque de Fraiture. The deposit can be paid, in advance, to the home owner by bank transfer.